Lunular Laser safely treats toenail fungus in only four 12 minute painless treatments. The Lunula Laser is a low-level laser in a box that effectively and safely treats onychomychosis. 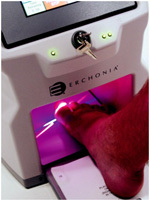 The Erchonia Lunula Laser uses low-level laser light to treat foot fungus, and requires very little time or set-up for physicians or their staff. It’s the only system you can turn on and walk away—the device is already pre-set. In fact, only four 12-minute sessions are needed to treat the affected area. One-hundred and five (n=105) toes were qualified and enrolled into prospective clinical study. All toes were diagnosed with Distal Later Subungual. Onychomycosis (DLSO). Toes were evaluated on four occasions: baseline and 2, 3, and 6 months post-procedure. The treatment phase consisted of four independent 12-min treatments separated by 7 days. No adjunctive modalities were used. Study success criterion was a minimum improvement of percent nail clarity of ? 25.0% at 3 months. Compared with baseline, statistically significant mean changes in nail clearance of 4.9 mm and 6.15 mm were observed at 3 and 6 months post-procedure, respectively (Figure 1). Lunula combines two therapeutically beneficial wavelengths: 405 and 635 nm. Each wavelength is capable of stimulating a specific cascade to effectively and safely treat onychomycosis. Both wavelengths are enriched by a proprietary, rotating line-generated beam; a unique delivery mechanism that maximizes photon concentration and treatment surface area – ensuring that all infected toes are properly treated. As a result, the Lunula provides a treatment absent of any adverse events while inducing key pathways to effectively address unsightly onychomycosis. The 635 nm wavelength stimulates cytochrome c oxidsase (CCO), an important enzyme necessary for the production of adenosine triphosphate (ATP) and reactive oxygen species (ROS). Increased ATP activates PI3 kinase/eNOS signaling pathways, which increases nitric oxide (NO) production. NO is critical for new blood vessel formation increasing nutrient delivery and infiltration of immunological cells. Additionally, NO is a powerful antimicrobial agent, and will help destroy the infectious agent. For resident macrophages and neutrophils, two types of immune cells, the increased production of ROS is quickly converted into cytotoxic hydrogen peroxide (H2O2), which is used by the immune cells to destroy onychomycosis-causing fungus. The 405 nm wavelength targets NADPH oxidase (NOX), a membrane bound enzyme, and increases NOX’s production of ROS, which can be converted into H2O2. As H2O2 starts to degrade the fungal cell wall and membrane fungi function and behavior will be greatly impaired. This can result in fungal death. Additionally, degradation of the fungi membrane and cell wall will increase fungal susceptibility to the body’s immune attack. 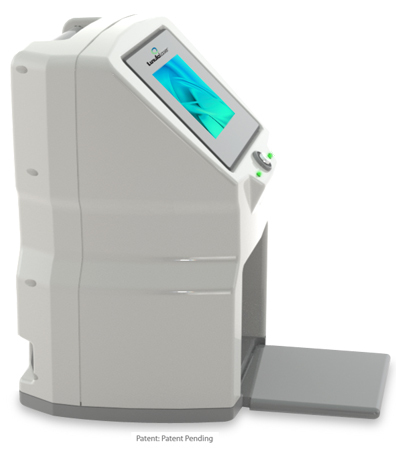 When applied concurrently, the two wavelengths represent a truly multifaceted treatment. SECOND – By increasing ATP and ROS to increase immune response by increasing blood flow and improving immune cell function.